On my WORDS site, you'll find a description of my background & experience in editing scholarly, trade, & reference books on urban affairs & public policy, international relations & the social sciences, psychology & education, language arts, music, Judaica, & other subjects, along wth biographies & memoirs — as well as books, monographs, working papers, & newsletters for non-profit organizations, think tanks, & research institutes. Plus: my work in lexicography, educational & audio-visual scripts, & writing seminars, workshops, & coaching. On my MUSIC site, you'll find descriptions of my compilation CD of new American-Jewish music for prayer, healing, dance, & meditation — OPEN THE GATES! 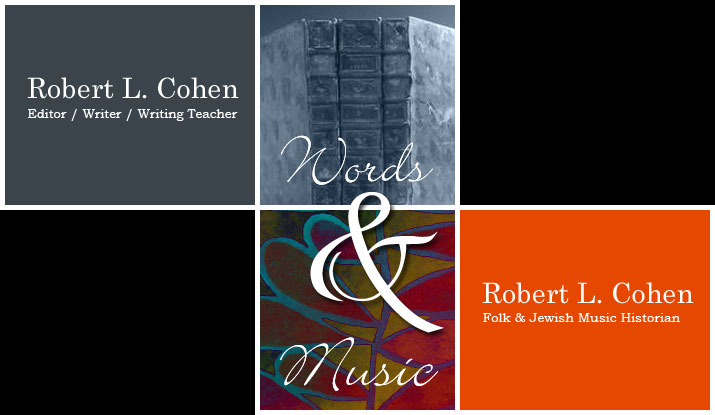 NEW AMERICAN-JEWISH MUSIC FOR PRAYER (including Jewish bluegrass, Jewish country, Jewish world music, a cappella harmony singing, & Hasidic chants) — along with descriptions of my lectures on American-Jewish music & American & New York City folk & popular music.